I'm sure you've heard the news already, unless you've been on another . . erm, planet ! Proposals from the IAU to define the term planet now mean that, if accepted, there would be 12 planets in the solar system. The basic definition of a planet proposed is this . . . .
"(1) A planet is a celestial body that (a) has sufficient mass for its self-gravity to overcome rigid body forces so that it assumes a hydrostatic equilibrium (nearly round) shape1, and (b) is in orbit around a star, and is neither a star nor a satellite of a planet.2"
You can read the IAU press release, question and answer sheet, and the draft of the Resolution "Definition of a Planet", on the IAU website. What this means is that if all that's approved next Thursday, there will be 12 planets in our solar system. The new ones being Ceres (the largest asteroid), Charon (Pluto's "moon") and 2003 UB313 (or Xena as she is temporarily known). There are also about another dozen objects which could qualify as planets once it's clear whether they pass the roundness test. Although this definition seems to be a reasonable compromise which is likely to be adopted there is plenty of comment out there on the proposals. Here's a selection. One of the main concerns is the shear number of potential planets under this system. 12 already, another 12 under consideration. Mike Brown reckons there are already 44 trans-neptunian objects discovered which mean the criteria, bringing the number to 53 ! Scientists seriously talk about there being thousands or even millions of icy Pluto sized bodies out there waiting to be discovered. But I'm reasonably happy. The IAU was selected a definition which is scientific and does not (for the most part) rely on arbitrary limits of size, mass or location. If we apply this definition and it results in thousands of planets in the solar system, that's because there are thousands of planets. If school children can't remember all of them, so what? We don't expect people to remember all the stars, we don't even name all the stars, just the interesting ones and the ones nearby. 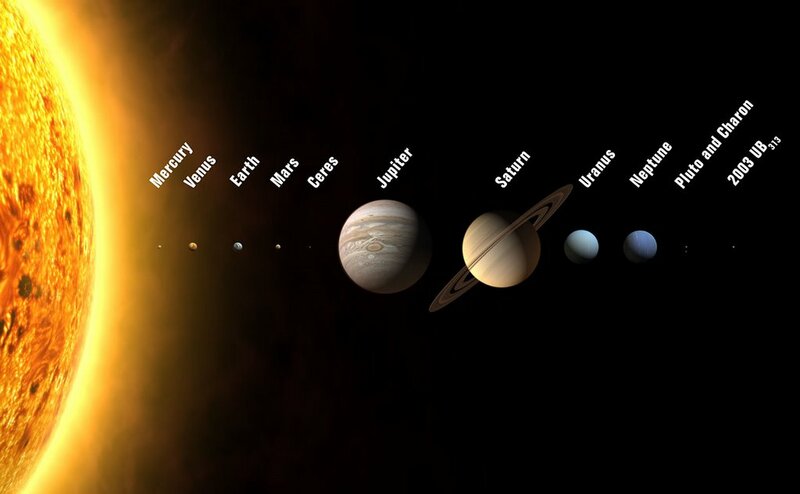 (come to think of it, can school children name all nine or our current planets ?). We'll probably need to further subdivide planets in the future, particularly as we learn more about other planetary systems, just like we have for stars. Again that's no problem. Things are likely to be confusing for a while, as best summed up in Stuart's brand new poem. But looking on the positive side, this is a great opportunity to get people talking about and interested in astronomy. Just yesterday at least half a dozen people at work asked me about the news and what it meant. We should use the opportunity to promote astronomy. I can see the next public event now, "Come and meet the new solar system" . . . . The definition of a double planet system like Pluto/Charon is interesting. According to the IAU defintion, the Moon will become a planet in the future as it moves further away from the Earth and objects in double/triple systems could alternate between being planets and moons as they orbit round each other!